NORMANDY, FRANCE: June 6, 1944 is the day that probably made Normandy so famous around the world. 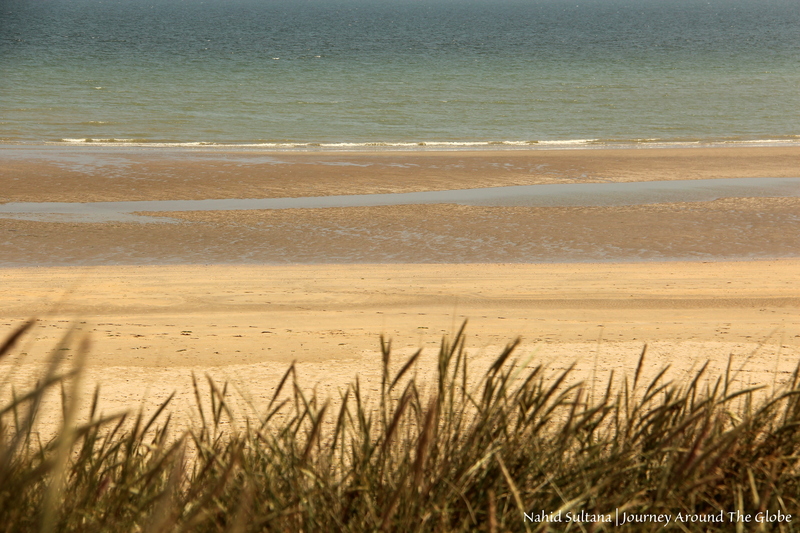 Normandy’s beaches are where the American, British, and Canadian troops landed on that day for their long-awaited D-Day allied invasion – Operation Overload during WWII. Normandy is not a city, rather a big region in northern-eastern France. 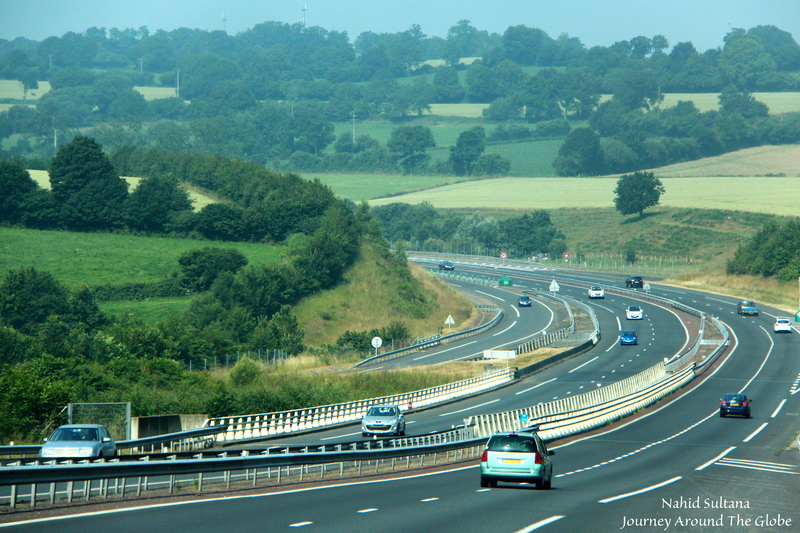 TIME of TRAVEL: We went to Normandy during the 4th of July weekend in 2013. It was close to 80 degrees Fahrenheit those few days we stayed there. It can be a bit chilly at night but pleasant during the day. OUR HOTEL: Our hotel in Normandy was in a small town of Bayeux, called Novotel Hotel Bayeux. 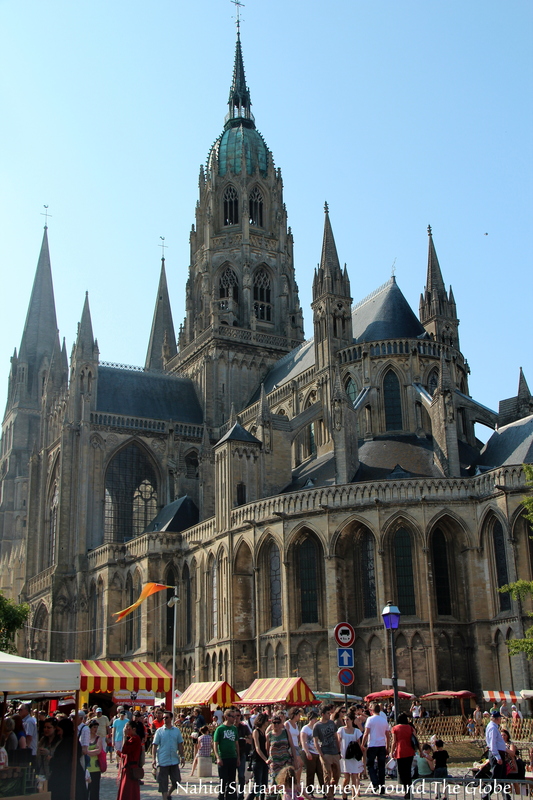 It was very close to Bayeux city center, its famous cathedral, and WWII memorials and museums. We had free Wi-Fi in the room but no free breakfast. They had a quick breakfast menu where we paid 4 euros per person (our kids were free) for unlimited croissants and hot drinks. Bayeux is was a good place for our trip; it was little more than 45 minutes of drive from the Parachute Church (Saint Mere Eglise) and less than half an hour drive from the D-Day American beaches. But other parts of Normandy, like Mont St. Michel, Etretat, or Giverny were all more than an hour drive. EATING and SHOPPING: Normandy’s egg omelet is something special and unique. They whip their egg until its light and bubbly. Our 1st lunch was at Utah Beach in a restaurant called “Le Roosevelt”. The building itself is a historic site where Germans had their communication center located. For the 2nd day, we were in Mont St. Michel and we ended up getting up a box of pizza from a small place in the mount. There were few seats there, so we took the box to nearby stairs and finished lunch there. During our visit to Giverny Monet Village, we had lunch in a restaurant near the garden’s parking lot “Grill au feu de bios”. The restaurant mainly serves grilled meat with veges and potatoes. What attracted us to this restaurant was its setting. It was beside a little garden and surrounded by lots and lots of flowers, just a perfect place to start our tour in Monet’s garden. War souvenirs, army toys and gifts, and WWII memorial items are what most of the tourists buy from Normandy. Mont St. Michel is also packed with many shops and royalties. Everything seemed more expensive here but the place definitely has some unique stores. Also, there are lots of paintings and art souvenirs in Giverny Monet Garden where you can find print copies of some of his very well-known paintings. 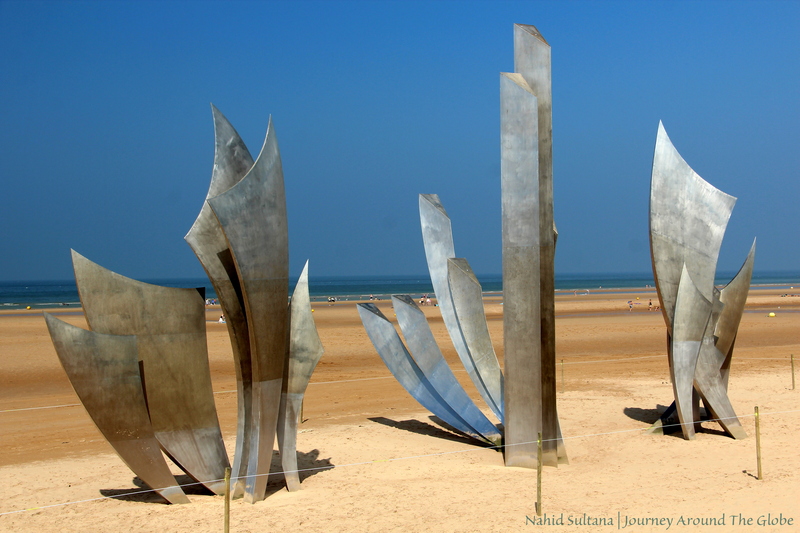 PLACE WE’VE VISITED: Main reason for us to come to Normandy was to visit the D-Day beaches and other WWII historical sites in this region. These D-Day landing beaches include 2 American beaches (Utah and Omaha), 2 British beaches (Sword and Gold), and 1 Canadian beach (Juno beach). We spent one whole day visiting the 2 American beaches and some other significant spots of Operation Overload from WWII. I really wanted to go to Etretat to see the white coast line and beautiful cliffs but we couldn’t manage in time for that trip. 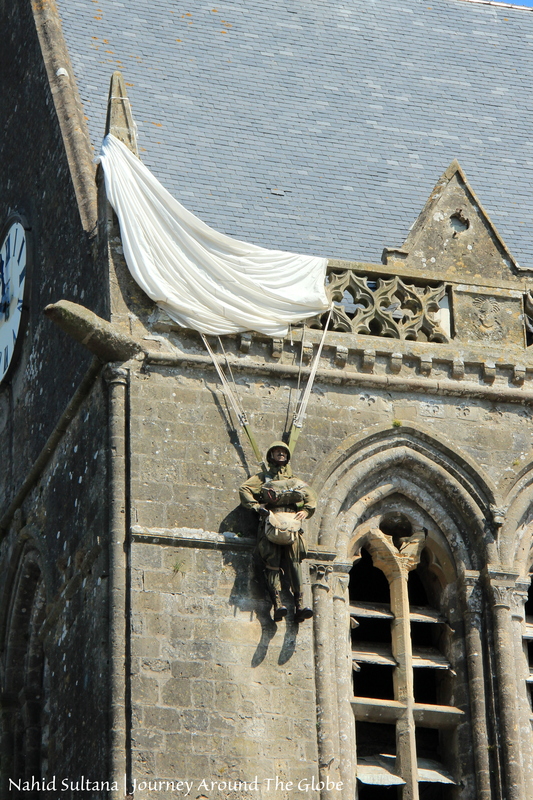 1) ST.MERE-EGLISE: Also known as Parachute Memorial Church, this is located in lower Normandy, about little more than half an hour drive from Bayeux. The town where this church is located also called Sainte-Mere-Eglise and is the most famous D-day village. It played an important role in WWII and was one of the first towns to be liberated in the invasion. This whole village is like a memorial to the American, British, and Canadian soldiers who fought in WWII…flags of these three countries are almost everywhere. Many paratroopers hung from trees and poles and were shot dead before they were rescued. The incident why this church became famous involved paratrooper John Steele whose parachute got caught on the spire of this church during D-Day. He hung there for 2 hours pretending to be dead. Later he was taken as a prisoner by the Germans but he managed to escape and rejoin his own division. Luckily the church was not destroyed in the battle. The church bell tower still has a dummy parachutist dangling from it, making it more like a monument to John Steele. Inside the church is very small and simple. Some stained-glass windows feature the Virgin and the child, surrounded by paratroopers. Do visit other war museums in this town if time allows. There is no entry fee and there is a big free parking in front of it for its visitors. 2) UTAH BEACH: Utah Beach is a D-Day landing beach where American troops came ashore through the early morning of June 6, 1944. We came across many memorials and monuments for the remembrance and commemoration of the US heroes before reaching the beach. But this is not a place for swimming or do any beach activities. You can see England vaguely on the other side of the ocean. We had our lunch in a restaurant and souvenir shop “Le Roosevelt” which is a historic building itself. After lunch we requested our waitress to take us to a bunker within the building. It was once used to be a German communication center and was later captured by the USA army. The bunker is still in its original settings with radios, transmitters, beds, and furniture. Utah Beach has plenty of war museums on the site, among those Utah Beach Landing Museum is probably the most notable one. We didn’t go to any museum but I am sure they are worth visiting. The beach is about 12 miles drive from St. Mere Eglise. 3) POINTE du HOC: This was a strategic point for the German fortifications on the Normandy coast. 30 meters above the sea, this site was bombed and shelled by US Rangers and was finally captured from the Nazi military. Today, visitors can still see many big and small craters that were created due to aerial bombings on this area. French government erected a symbolic granite dagger atop the bunker where bodies of soldiers still lie under the ruins, commemorating all the US soldiers who have fought bravely in defeating the enemy. Other than the shell craters, you can also see some underground rooms, gun position spots, ammunition storage area, and bunkers here. There are no original guns or canons on the site but the open air park definitely gives you a sense of pride and respect. 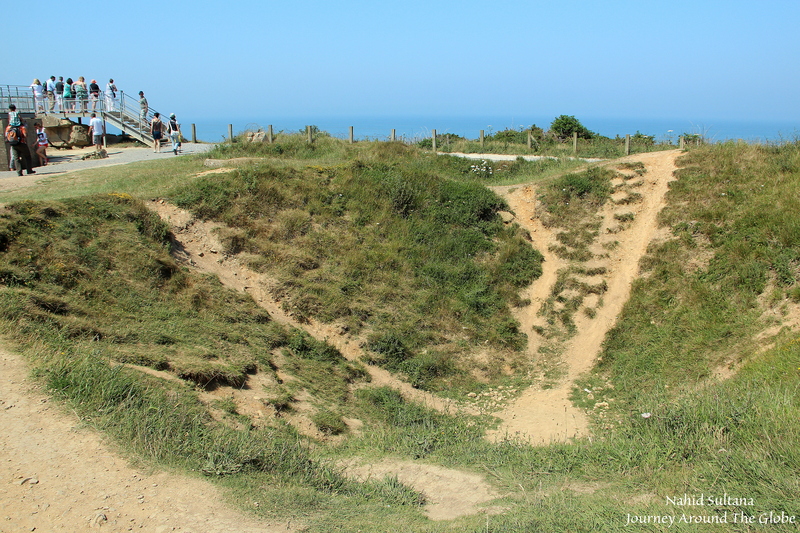 Pointe du Hoc is located by the Atlantic between Utah and Omaha beaches. View of the cliffs and the beach down below are very scenic. The French government transferred the area to the American Battle Monuments Commission in 1979 for perpetual care and maintenance. We spent about little less than 2 hours here just walking by the craters, enjoying the surroundings, and imagining what must have gone here almost 70 years ago. It has few designated free parking spaces for visitors and there is no entry fee. 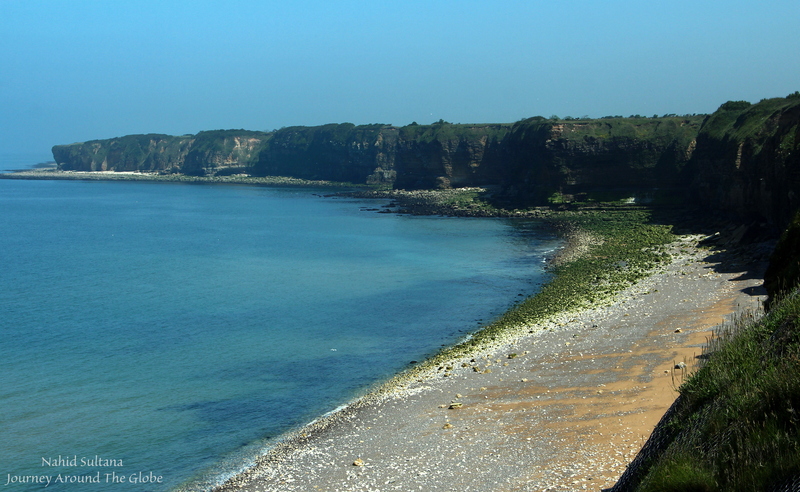 4) OMAHA BEACH: Omaha Beach is about 10 minutes of drive from Pointe du Hoc. This is longer than Utah Beach and another historic site where US troops landed on June 6, 1944. Here we saw people were actually swimming and playing by the beach. So, bring your trunks and swimming suits for this place. 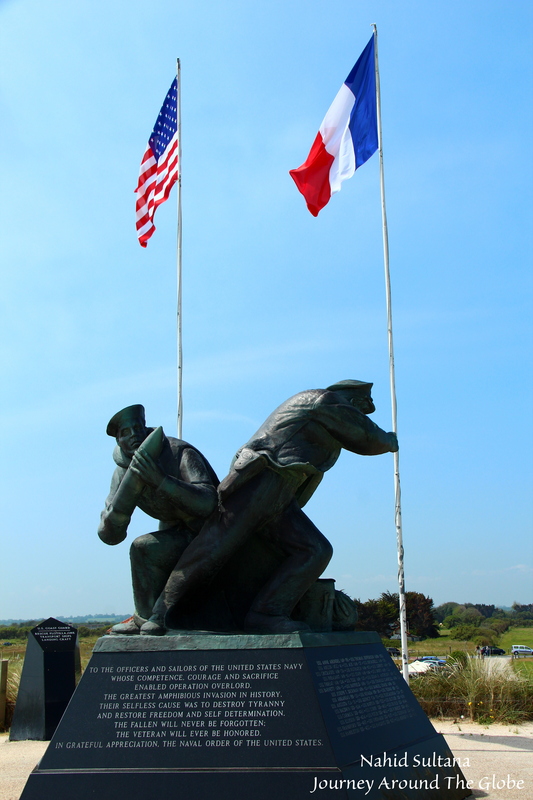 There are few statues and memorials honoring Allied Forces soldiers for their bravery. Although we didn’t go to any museums here, there are numerous of them in Omaha Beach and I highly recommend going to couple of these museums to get some real pictures and feelings of what happened in D-Day and during their operation. 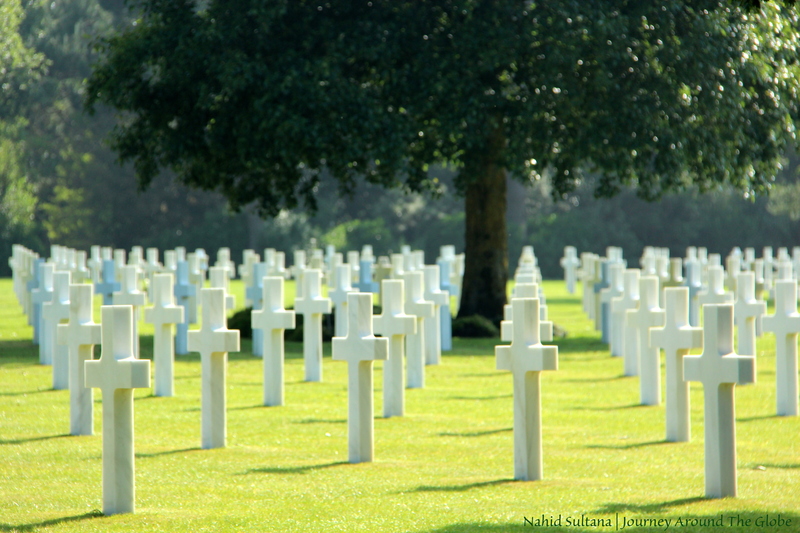 5) NORMANDY AMERICAN CEMETERY and MEMORIAL: This is a resting place for 9,387 US soldiers, most of whom lost their lives during the Normandy Campaign in WWII. There are 1,557 more names of missing soldiers in a garden of memorial. This is a place definitely brings your patriotism out and makes you feel proud for what our soldiers can do for humanity and justice. 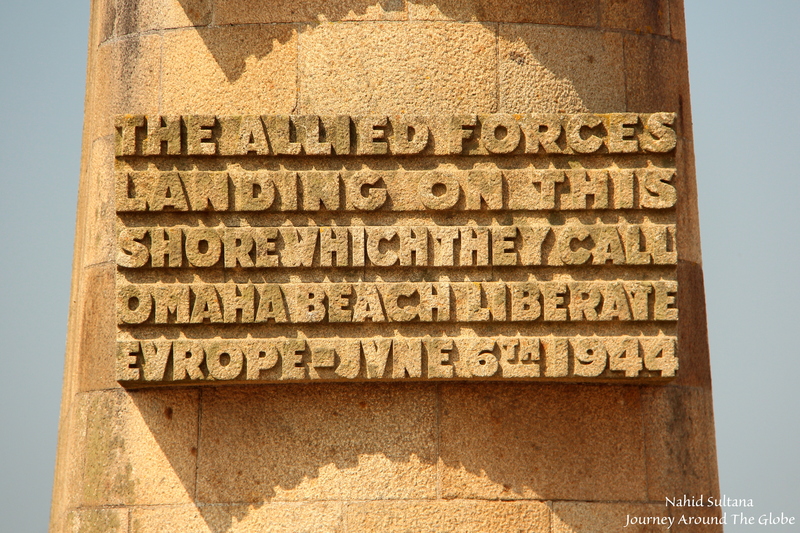 The cemetery overlooks Omaha Beach and there is a narrow passageway which leads down to the beach from the top. Take some time to stroll between the perfectly designed rows and aisles of these graves. I overheard someone saying Italian marble have been used for all the headstones of those graves. It’s a big open space with lush green lawn and unforgettable tranquility. A chapel, a Memorial, and a Garden of the Missing pay tribute to their memory. Families came from all over the world (especially U.S.A) to pay respect and tribute to these brave heroes. The cemetery closes at 6 pm and is free to enter. Museum in the cemetery has a fee but we didn’t go there. 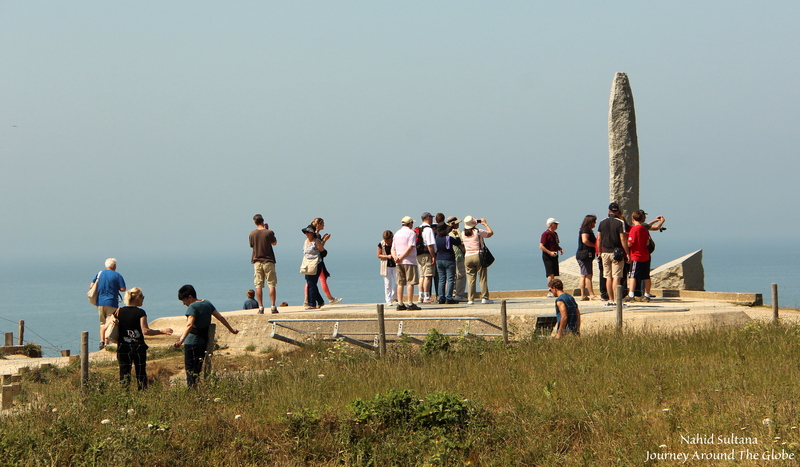 We spent about 1 ½ or 2 hours here at the end of our 1st day in Normandy. 6) MONT ST. MICHEL: The Island of Mont St. Michel is best known for its very well-preserved abbey of St. Michel at the peak of a rocky island. 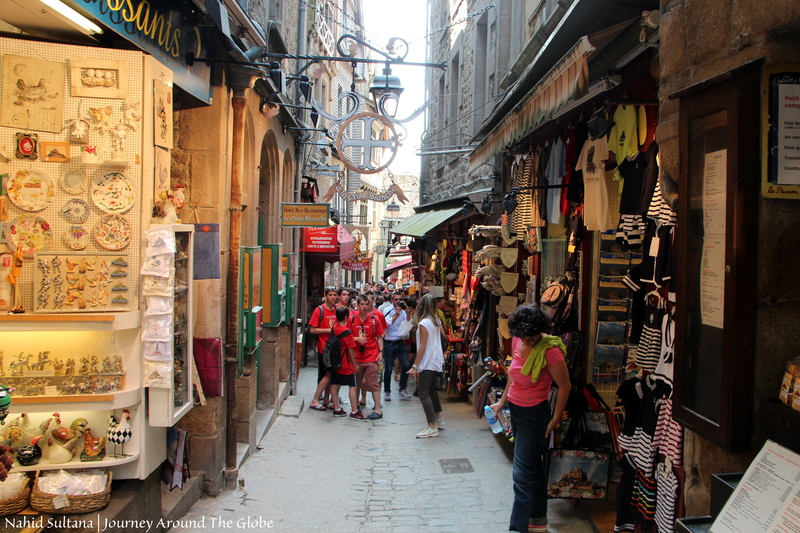 This is one of the most beautiful medieval islands with lots of twisty alleys and up and down passageways. The long history of Mont-Saint-Michel is thought to date back to 708 AD when a sanctuary was built in honor of the Archangel. Soon it became a major focus of pilgrimage and by the 10th century a village grew up below its walls. The Mont-Saint-Michel fortifications were gradually built between the 13th and 16th centuries to protect and defend the abbey and the village. Now it’s listed as a UNESCO World Heritage Site and attracts more people than the Eiffel Tower of Paris, making it the number one visited landmark in France. The abbey of Mont-Saint-Michel is a unique building. Constrained by the pyramidal shape of the Mount, its medieval builders wrapped the buildings around the granite rock. It was used as prison during the French Revolution. The abbey church is big but simple and is situated at the top. Follow the signs and walk around the enormous abbey to explore its cloister, terraces, big halls, crypt, and chapels. Be amazed by the old walls, floors, ceilings, and doors. The spire of the abbey stand between sky and sea, crowned with the statue of the archangel. Be ready to climb many steps to go up to abbey. There is no water surrounding the island during low-tide. But when the water is high, it’s advisable to take the shuttle bus instead of trying to reach the island any other way. 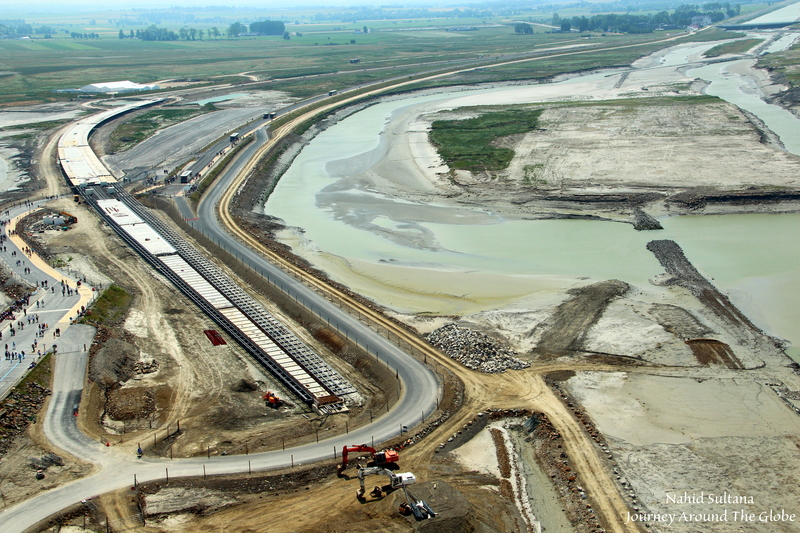 There are many quicksand and deep mud holes where unwanted events happened in the past. It’s better to take an experienced guide or check the tide tables. 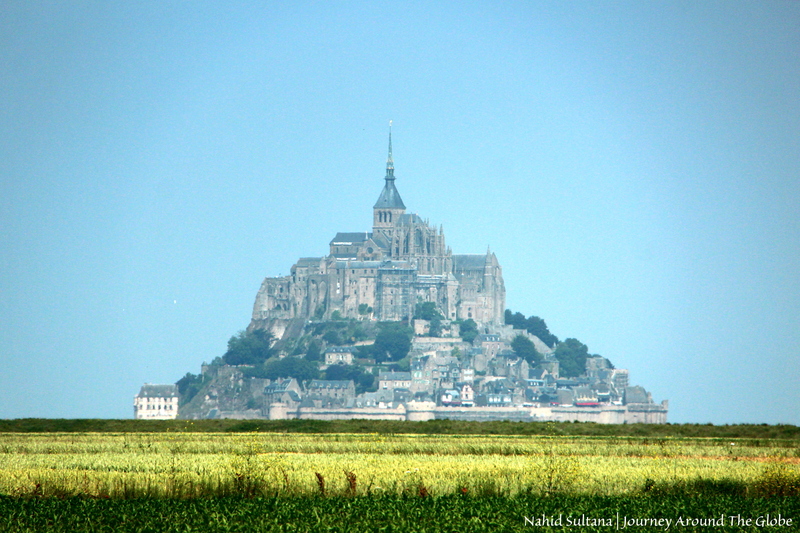 Mont St. Michel was about 1 ½ hours of drive from Bayeux and is located in Lower Normandy. It’s about 10-15 minutes of walk to the entrance after shuttle drops you off. Plan to spend at least half a day or more in the island of Mont St. Michel. The abbey is open from May 2nd to August 31st: 9am – 7pm and from September 1st to April 30th: 9:30am – 6pm. There is a paid parking but the shuttle bus that will take you to the island is free for the visitors. Food on the island can be very expensive. Visitors can pick up some food where shuttle picks you up from near the parking ground. There is also a horse driven carriage you can take to and from the parking lot which will cost 5 Euros per adult each way. 7) BAYEAUX CATHEDRAL and CITY CENTER: Our original plan, after visiting Mont St. Michel, was to go to Etretat to see its cliffs and rocks. But since we started the day a bit late and spent more time in Mont St. Michel than expected, we had to cancel Etretat. Instead we came to Bayeux to spend time here. Bayeux was the first French town to be liberated from the Nazis. 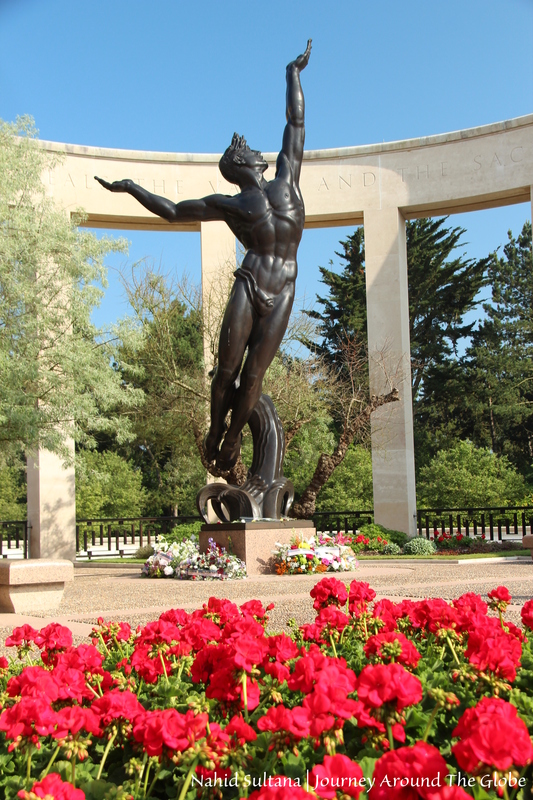 It has some WWII D-day museums and memorials along with the largest British war cemetery in Normandy. Another reason tourist usually come here is to see the famous Bayeux Tapestry and its museum. There was a big festival going on the weekend we visited Normandy, called “Medieval Bayeux”. We never went to any Renaissance or Medieval festivals, so this was a great fun for all of us. The festival took place around Bayeux Cathedral in the city center. This Norman-Romanesque cathedral as constructed in 1077 in the presence of William the Conqueror – Duke of Normand and King of England. The edifice now is a national monument in France. It looms over the entire town and its grandness can be seen from afar. It has a gorgeous altar, an empty crypt, some excellent murals, rich stained-glass windows, and very decorative interior. Outside structure of the cathedral is very dignified too with striking masonry. It’s free to go inside and definitely worth a visit. 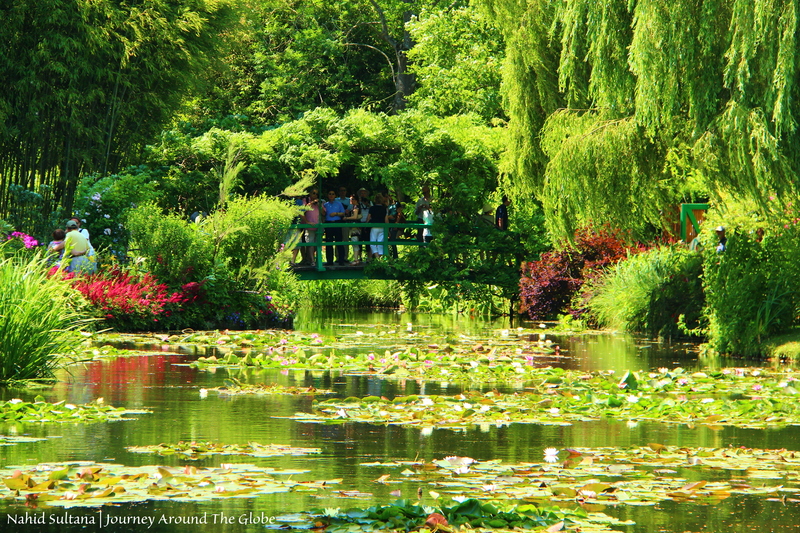 8) GIVERNY MONET HOUSE and GARDEN: Giverny is a small French village only less than 60 miles drive south from Paris. This is a very pretty place with artistic houses and surroundings decorated with green plants and colorful flowers. The village of Giverny, also known as “Cradle of Impressionism” became well-known for the famous impressionist painter Claude Monet. He lived, painted some of his best paintings, and died in 1926 in Giverny. Garden surrounding the house where Monet moved in during late 19th century is what inspired him with his works. Many of his paintings were influenced by the weeping willows and water-lily pond of this garden along with one famous painting that include “Japanese Bridge” in the backdrop. Tourists can see all these subject matters that once inspired this famous artist in this Monet Village. People don’t want to miss the chance of standing on that “Japanese Bridge” of this garden. Come early if you want to avoid the crowd and like taking pictures without too many people in the background. 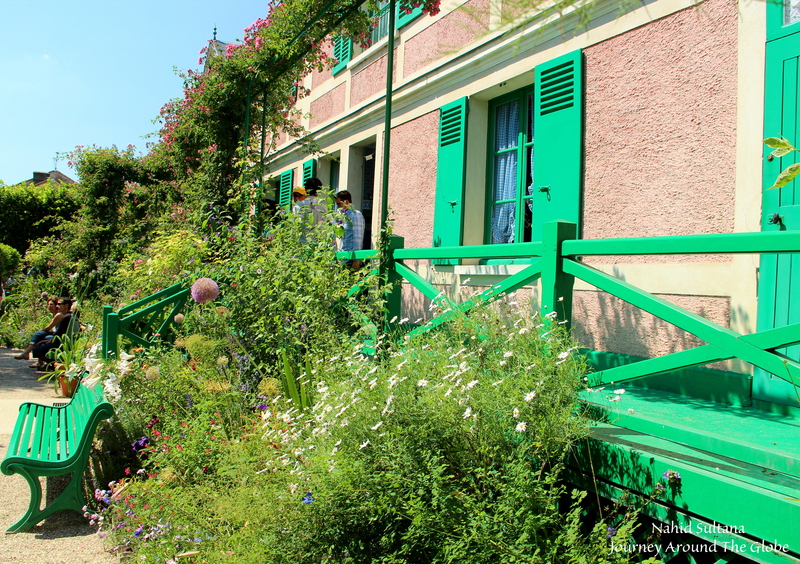 Monet’s house is located on the other side of the garden with a view of a big garden in the front. Walking around the garden gives you a splash of colors in your eyes. The house has lots of paintings of Monet (none original whatsoever) including his big collection of oriental style copies. His bedroom where he took his last breath in 5th December 1926 is also in display for the publics along with other parts of the house. 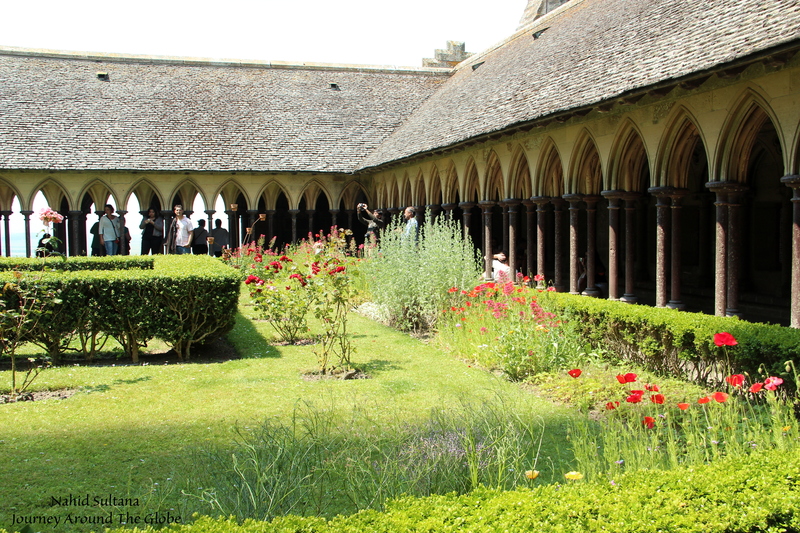 It took us about little more than 2 hours from Bayeux to get to the garden. It’s located in Upper Normandy. 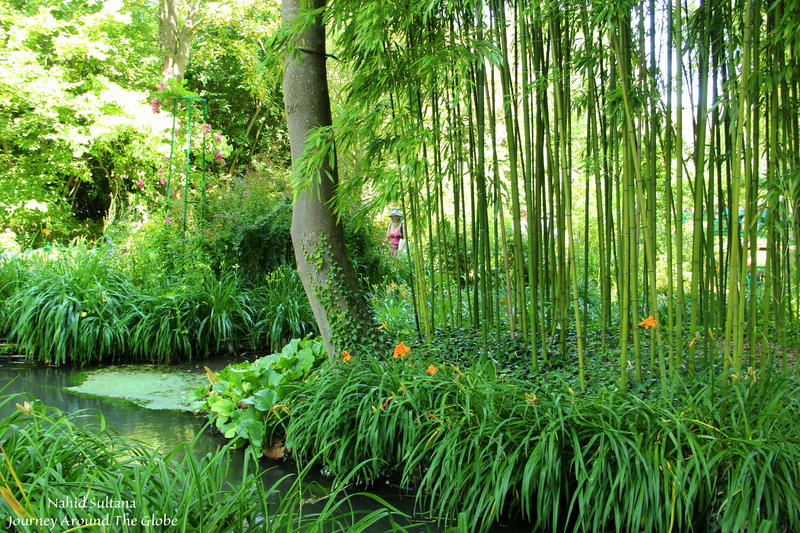 The garden is open daily from 9:30 to 6 pm and the address is 84 Rue Claude Monet, Giverny, France. Entry fee for adults is 9:50 euros and free for kids under 5 years. There are more than one free parking grounds for the garden visitors. 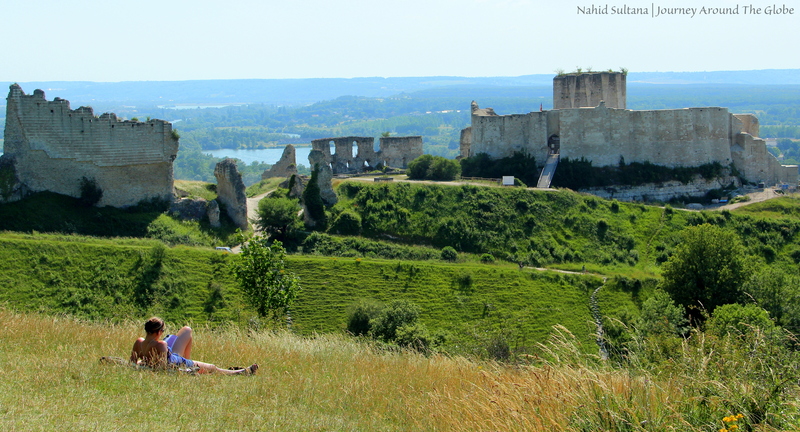 9) CHÂTEAU GAILLARD: This was our last stop in Normandy. Château Gaillard was constructed in 1196 by Richard the Lion heart, who was the King of England as well as Duke of Normandy at that time. It was a symbol of not only a modern military structure for that age but also a symbol of power of Richard the Lion heart. 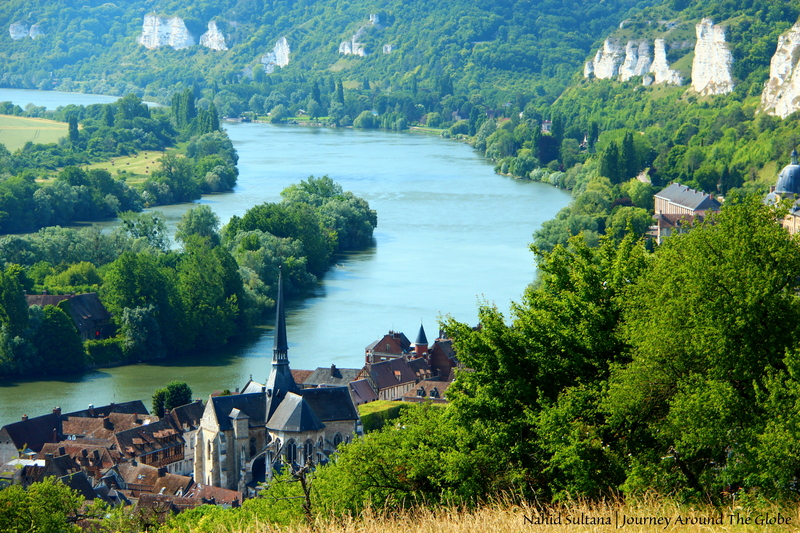 The location of it is very scenic, overlooking River Seine. The fortress is in ruins now. Remains of the keep and some towers can still be seen here. From a distance, we could only see the skeleton with old walls and the towers. Château Gaillard is located in Upper Normandy in the commune of Les Andelys, within 60 miles from Paris. It took us about less than half an hour to drive here from Giverny Monet Garden which is 20 miles away. We didn’t go very close to it, just observed it from a view-point where you can see the ruins, River Seine, and surroundings. It was absolutely a breathtaking view. Address of this fortress is 8 Avenue de la Republique, 2770 Andelys (Les), France. The lower court is open all year round and upper court is open every from April to the beginning of November except on Tuesday and 1st May. Opening times: from 10am – 1pm and from 2pm – 6pm. Entrance fee is 3:20 euros per adult.